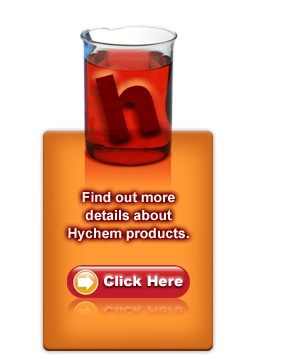 Hychem Inc. has over 30 years’ experience as a supplier of Water-Soluble Polymers for Industrial Liquids/Solids Separation Markets in the U.S.
Hychem has the largest available range of high-quality flocculants and coagulants for numerous applications in Industrial water and wastewater treatment, sludge dewatering and process water treatment. Our products for these markets have been established over many years as a result of Hychem’s commitment to ongoing research and product development to meet specific industry needs. Hychem has built a strong nation-wide reputation as a result of our personalized approach to customer service - provided by our highly trained and motivated technical sales and service force and our customer service representatives. Hychem’s Technical Sales Representatives and Account Managers are located throughout North America and are all experienced engineering specialists in the field of Industrial Liquid/Solids Separation. Their expertise and experience provide our customers with first class advice on product selection and application as well as solutions to process problems. Hychem’s emphasis is on helping our customers control total costs by ensuring the use of the best Hychem product for the application and optimizing those parameters that contribute to process efficiency. In addition, Hychem’s Equipment Group provides state-of-the-art polymer dissolution and delivery systems to ensure optimum product performance. Copyright © Hychem, Inc. 2012. All rights reserved. Site designed by J.D. Hill, Inc.